Article first published as Book Review: ‘The Complete Model for Positive Behavior Management’ by Dina Al-Hidiq Zebib on Blogcritics. 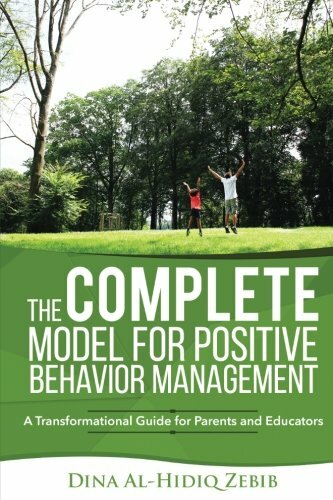 “The COMPLETE Model for Positive Behavior Management” by Dina Al-Hidiq Zebib offers simple, yet powerful advice on how to manage behavior in a positive way. This book is jam-packed with ideas, examples, and tips that can immediately be taken directly to the classroom or home. Ms. Al-Hidiq Zebib has provided not only educators and parents with a how-to manual for raising and teaching children through positive behavior management, but her ideas and techniques are useful to all people. As a former educator, this book would have been extremely helpful to me in classroom management. I think back on my time in the classroom, and wish I had this book available to me as a resource. I also believe that all human beings can benefit from the ideas shared in this book. Just the tips on active listening alone could help countless relationships that struggle with communication. The tool on values is useful for anyone wanting to really get focused on what is important to him or her. Young people often struggle with knowing what their values are, but many adults have the same problem. The use of a matrix at home and at school can be valuable to everyone in tracking daily routines as well as progress over time. The author spends some time on praise, and how to provide authentic and specific praise so children (and adults) know why they are being praised. This significantly adds to the feeling of accomplishment for the one being praised. Ms. Al-Hidiq Zebib also stresses the importance of tactful correction. The Non-Progressive Consequence System is a compact tool that can serve as a powerful reminder of what can be done when corrections need to be made. There are so many examples of great ideas and tips in this book, I cannot possibly cover them all in this review. I highly recommend “The COMPLETE Model for Positive Behavior Management” by Dina Al-Hidiq Zebib for not only teachers and parents, but for all people in general, as well. I know that I will be able to use many of the ideas and tips in this book in my relationships at home and at work. I will definitely be sharing this book with former teaching colleagues as well as many others. This book is truly a gem!